You will slave in the kitchen making these potstickers--from prep all the way through cooking--but they are sooooooo worth it! 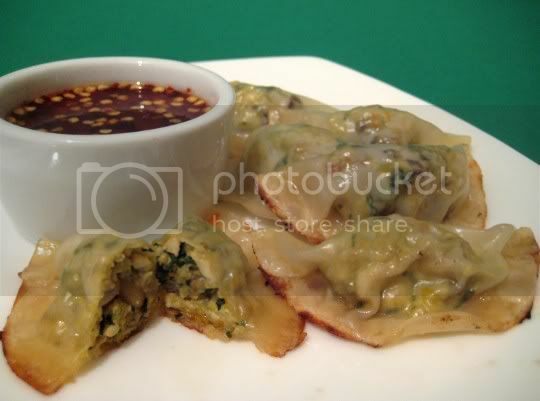 These are as good (or even BETTER) than the traditional potstickers you'd get in the best Chinese restaurants, with a few unique twists. The filling for these is very complex with many ingredients: pine nuts (for a wonderful crunchy texture), garlic, fresh ginger, soy sauce, sugar, tofu, mushrooms, and (here are the surprises) orange zest and cilantro. These last two ingredients, especially the zest, really come through with a ton of flavor...and such powerful citrusy notes are unexpected for an Asian dish. What will take time is the tofu pressing (an hour), the mushroom soaking (30 minutes), and of course creating the actual potstickers. The recipe says this creates about 28 pieces, but I had many more than that, maybe close to double that amount. And maybe I used the wrong size gyoza wrappers, but the suggested amount of one tablespoon per wrapper was entirely too much...so I reduced it to one packed teaspoon and it was perfect. To cook these, fry them in a little oil (or cooking spray), and then pour a little of the mushroom-soaking water in, and cover and steam them. You probably can use regular water, but the mushroom water gives it an extra earthy flavor and color. The Red Crystal Sauce is extremely easy to make: simply bring sugar, salt, red wine vinegar, red pepper flakes, and grated carrot to a boil (make sure the sugar is dissolved). The sauce is tangy, sweet, and spicy all at once, and very very powerful. Dipping the potstickers in this stuff is so addicting! Make again? A great crowd pleaser, but mental preparation for the task ahead is necessary! Oh, and I couldn't stop eating them!